1. 1-quart peaches, canned, sliced, drained. 6. 1 1/2 cup sugar. 8. 1 tablespoon whole cloves. 1. Combine the peach syrup, the pint of hot water, vinegar, sugar, cinnamon stick and cloves in a sauce pan. Simmer for 15 minutes. Remove from the fire and strain. 2. Add the gelatin to the hot liquid and dissolve thoroughly. 3. Add the cold water and stir. 4. Place a small amount of gelatin in each mold. Chill until firm then removes from the refrigerator. 5. 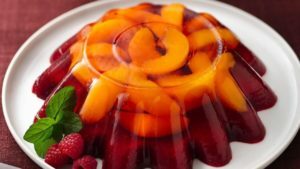 Place the sliced peaches in each mold and cover with the remaining gelatin. Return to the refrigerator and chill until firm.